Canada hardly seems the place of race riots, segregated schools, racially-based unions, mass deportations, state-sanctioned discrimination and attempted cultural genocide – but it is. Through much of its history racism has coursed through the veins of Canada’s political and economic culture. Respected prime ministers such as Macdonald, Borden and Mackenzie-King have approved and Canadians supported policies and actions that were cruelly racist. The Last Steps to Freedom tells the story of Canada’s legacy through the experiences of Chinese, Ukrainian, Jewish, Japanese, Black and Native Canadians. Figures mysteriously absent from our collective mystery such as Viola Desmond, Big Bear, Ivan Pylipiw and others are celebrated. The book asks Canadians to look truthfully at our past, admit our mistakes, atone for our crimes and celebrate our progress. 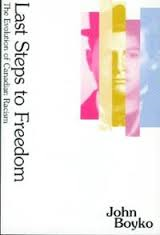 Last Steps to Freedom: The Evolution of Canadian Racism was published in 1995 by J. Gordon Shillingford Publishing. It was updated and reprinted in 1998 and reprinted again in 2000, 2008 and 2012. This book is an excellent research resource and teaching tool. I have built a course around it on diversity and racism in the Canadian context at Algonquin College. Thank you for your kind words and for using the book. One of my students created this video inspired by your book. Hello. Please tell Cryilene that I liked the presentation very much, especially that it was ended with a review of positive gains and a recognition that much remains to be done. Hahaa, ehkÃ¤pÃ¤ myÃ¶s Juha Leinivaara on salmua-slimi! PÃ¤tevÃ¤thÃ¤n jokseenkin kaikki vÃ¤itteet myÃ¶s hÃ¤neen! EhkÃ¤pÃ¤ meissÃ¤ kaikissa asuu pieni muslimi. Salaliitto!